Resolve error H202 or other multi-user errors when opening QuickBooks Desktop over a network by editing Windows hosts file. This solution is intended to be used as a workaround to bypass broken Domain Name Settings (DNS) within Windows. If you are not comfortable with these steps or have questions relating to DNS settings, Intuit recommends you contact a qualified IT professional or refer to Microsoft article. To perform the following steps, you need Administrator access to the server and any computers connected to the server. It is recommended to have a pen/paper handy to write down the required information as you may be going back and forth to computers. Follow these steps for the server and any computer/workstation connected to the server. On the server, press Windows + R to open the Run window. Type cmd and press Enter to open a Command Prompt window. Type ipconfig /all (there is a space after ipconfig) and press Enter. 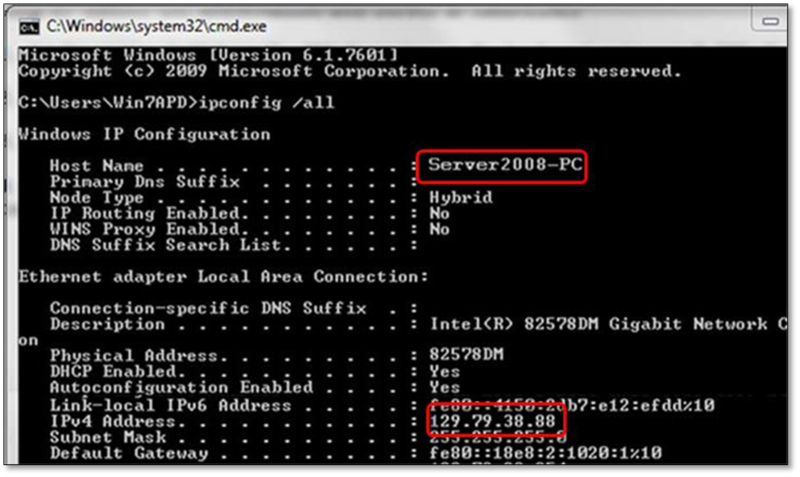 Take note of the Host Name (computer name) and the IP Address (it will either be IP Address or IP Address v4). Repeat steps 1-4 on any additional computer connected to the server. Important: Hosts files deal with STATIC IP addresses. If the network is using DYNAMIC addressing, this could cause problems if the server is rebooted & obtains a different IP address then configured in the HOSTS file. The Windows server should be configured to maintain the same address for the network at all times. On the Server, select the Start menu and Computer. Choose Notepad if you are asked to select a program to open with. After completing steps 1 and 2, open QuickBooks in multi-user mode. Asked to save the host file? When using Windows Vista/Windows 7/Windows Server 2008, you may be prompted to Save As because User Account Control (UAC) is turned on. You may need to perform the following to save the file. In the Save As window, enter "hosts" (include the quote marks) in the File Name field. Select Desktop as the Save As location, then select Save. Find the hosts file on the desktop, right-click, and choose Copy. Go to C:\Windows\System32\Drivers\Etc. Find the hosts file, right-click, and choose Rename. Rename the hosts file to hosts old, then select Continue. Press CTRL+V keys to paste the new hosts file and select Continue. Note: Repeat steps 1-6 for additional computers running Windows Vista/Windows 7/Windows Server 2008.